Exam Screen : Once the candidate has selected a exam mode (learn/exam) and selected type of questions as discussed in previous section exam will start and questions will be displayed as shown below. 1. Question Area : This is the section where the question and answer options will be displayed. Note that some questions may require you to open and additional window for displaying questions. 2. Show Answer : Click this button to view the correct answer for the current question. This option will not be available in exam mode. 3. Reset : Click this button to clear any selected answer. 4. Notes : Click this button to add notes for the current question. 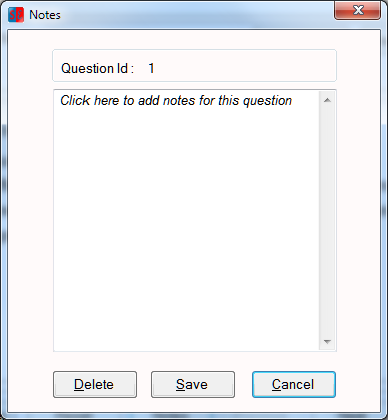 A separate window (shown below) will open which will allow candidate to enter, save, delete notes for current question. Notes for question are independent of each other. 5. Previous : Click this button to view the previous question. 6. Next : Click this button to view the next question. 7. Review : Use this button to review all the questions in current exam. Clicking this button will open a "Review" screen as shown below in which all the questions are listed. Selecting a question : User can select a particular question by double clicking the question in the list. 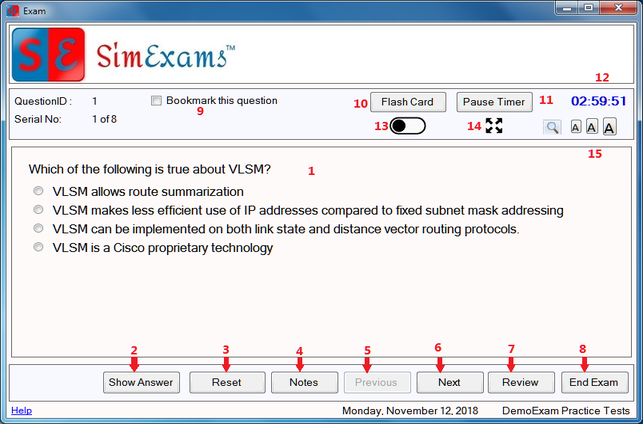 Once you double click the selected question will be displayed in the exam screen. Identifying bookmarked questions : All the bookmarked questions are displayed in list with pink background. Attempted questions : Status of each question (Answered/Unanswered) is shown next to it, which helps candidate to identify the questions which still needs to be answered. Retake: This option allows user to retake specific questions. User can retake Only bookmarked, Only unanswered or Only incorrect questions. Note that "Incorrect Questions only" option is not available in exam mode. 8. End Exam : Click this button to end the exam and see the performance summary in Grade screen. 9. Bookmark this question : Check (select) this option to add current question to bookmarked question list. Uncheck (deselect) to remove bookmarking. 10. Flash card : Clicking this button will open the flash card which provides explanation provided for the current question. 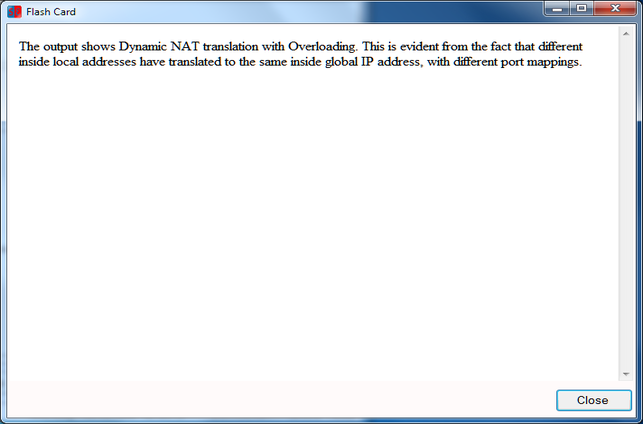 Flash card window is shown below. 11. Pause Timer : Clicking on this button will pause the timer for the exam, clicking it again will start timer again. 12. Time : This shows the time left for exam. 13. Night Mode : This option can be used to enable and disable the night mode. Exam screen in night mode is shown below. 14. 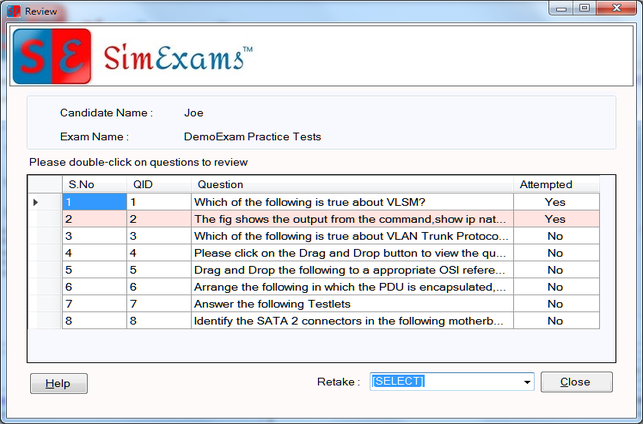 Full screen mode : This option can be used to view exam window in full screen. When used it will hide the banner on exam screen and windows status bar. To exit full screen click on "full screen" image or press escape button on keyboard.